Bihar State Housing Board (BSHB) invites the applications for the allotment of 1054 residential flats which are located at Dalpatpur Ara. The registration process of BSHB New Housing Scheme 2017 has been started from 26 January 2017. 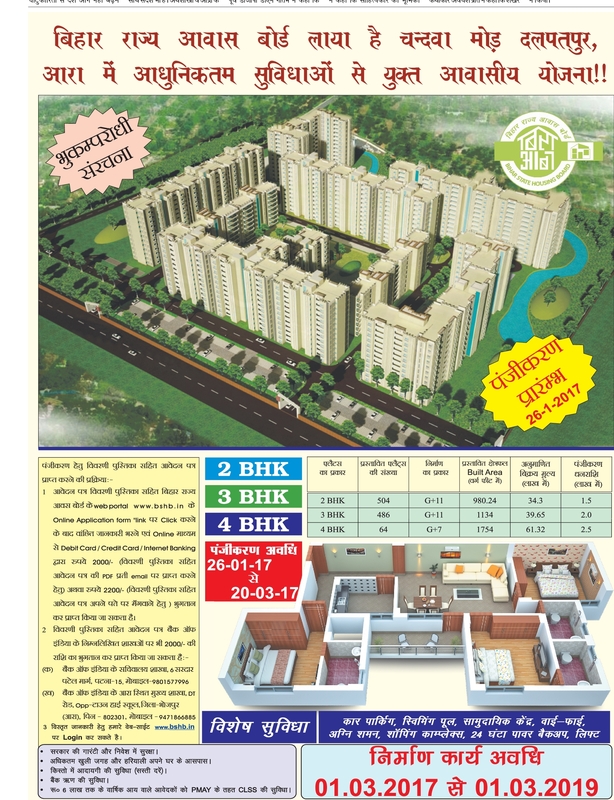 Under the scheme, the BSHB has offered total 1054 2,3 & 4BHK type of flats. Of these, 504 flats are 2BHK type, 486 are 3BHK type and remaining 64 units are 4BHK type. According to the scheme, the build-up area of 2BHK flats is 980.24 square feet, 1134 square feet of 3BHK and 1754 square feet of 4BHK respectively. The applications are being offered for scheme registration through the both online and offline mode from 26 January 2017 while the last date of the application form submission is 20 March 2017. The interested applicants can apply for the scheme through the both online and offline modes. The applicants can fill online application form by using the official website link of Housing Board at http:// www.bshb.in. While in offline mode, the application form can be obtained the application form from the designated bank branches on payment of Rs. 2000/-.